Time the event took place (drawn from the workstation, not the exchange). Name of the exchange where the event occurred. Name of the product as drawn from the Market Grid. Name of the contract as drawn from the Market Grid. Order type (i.e., Vol, Block, Basis). 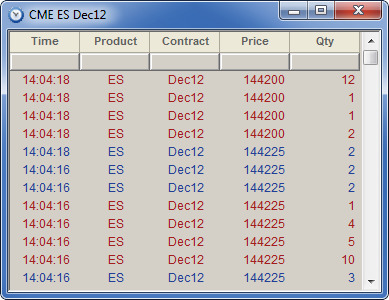 A unique identifier for OTC trade types is displayed to help differentiate between the different OTC order types. Buy/Sell price of the product. Quantity of the product that was bought/sold. Bid Mbr Counterparty information of the Bid Member. Ask Mbr Counterparty information of the Ask Member.